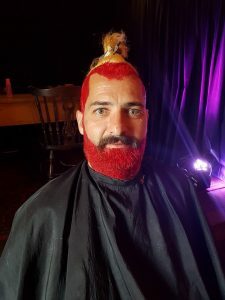 Kez Goes Strawberry Blonde, nearly! 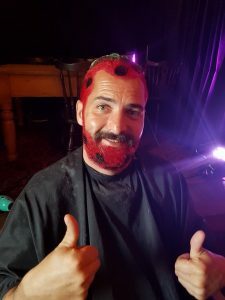 Thanks to everyone who voted on the Hair for the Dogs challenge. The results have been tabulated and the winner was Strawberry! Only by the narrowest of margins mind you, Kez was nearly going to be a Monk, poor man. Highlights of the (very long) evening. 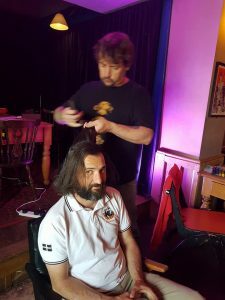 We would like to offer our very grateful thanks to Beerwulf for agreeing to play host, and for accommodating our demands, and of course to the utterly amazing Phil, from The Salon, for an absolutely stonking marathon of hairdressing and styling. What a guy! We would also like to thank the wonderful people (and dogs) who turned up to support Kez in his hour of need. I don’t know the names of all who came, but thank you all so very much for helping to make this so much fun! 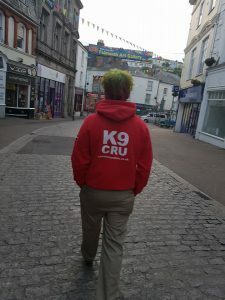 Hollie Trahearn and Teddy Pom, ex K9 Crusaders dog Fred, with his mum and dad, Graham and Liz, Ryan and friends, Colin, Stu and Little Jack, Lizzie, Wesley and friend, Sammi and the Trespass team.